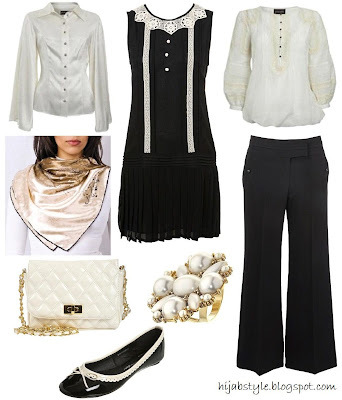 Black drop waist collar dress £20, Miss Selfridge; kimono sleeve blouse £55; ivory poetic blouse £39, both Principles; cream esarp £10, LOSVE; black button trousers £25; pearl cocktail ring £10, cream patent cross body £12; all Dorothy Perkins; black patent bow pump £20, Miss Selfridge. Hint: The dress may be out of stock online, but check availability in stores. Or check out other black drop waist dresses like the Renee embellished dress from Oasis. i like the pants masha'Allah! I LOVE IT ALL! mashallah, you have really good taste! Us hijabi girls are wonderful in picking out the right outfits and the right colors. this is beautiful. Hijabee, glad you like it! AMW, they're such a wardrobe staple! I wore black and white the other day and I must say I receieved compliments :). Fab combination!